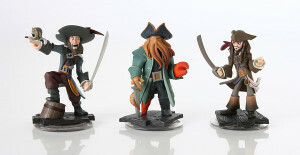 For each Disney franchise included in Infinity, there is an associated Play Set. Each Play Set includes a set of characters, a world to play in and gadgets to use (such as weapons and transportation). For example, the Lone Ranger set allows you to play as either the Lone Ranger or Tonto as you fight the villainous Butch Cavendish in the fictional town of Colby. Some of the gadgets include a stage coach, and elephant and a TNT pack. After all, you never know where that glove’s been. Toy Box is one of two modes available in Infinity, the other being your stock standard adventure world approach represented by the play sets. As the Infinity site cheerfully states, Toy Box mode allows you to: “make your own worlds, create games with your own rules, or build places that only exist in your imagination”. It might be the only chance you ever get to playfully appropriate Disney property without a swift slap in the face with a fat white glove. Enjoy it. Many critics have already drawn the obvious comparison between Disney Infinity and Skylanders. Both employ clever business strategies which coerce the user into maximising their financial investment in the game by tempting them with obligatory upgrades in the form of collectible character figures used to unlock new play sets. In addition to this, Disney Infinity users can also purchase Power Discs which allow you to enhance, expand or customise your experience. Also available for purchase is a Disney Infinity starter pack, which includes three character figures and their associated Play Sets, a Disney Infinity Power Disc and the Disney Infinity Base (which is connected to your console via a USB). I won’t discuss costing as it’s really not my concern; but hey, you can always check Amazon. 1.) The assumption that commercial imperatives are incompatible with genuine fan engagement is misguided. Often, commercial products become financially successful primarily because they succeed in engaging their audience. 2.) Likewise, the assumption that commercial imperatives are incompatible with quality is also grossly misguided. The two are not mutually exclusive. Whilst a heavy injection of cash can introduce mitigating political interests, it can also free up time, space and provide access to resources necessary to produce a quality product. 3.) The art of the up-sell, particularly via merchandising (e.g. Infinity entices users to purchase and collect character figures in order to unlock additional play-sets) has been used extensively in franchising models since the 1980s. It can be crass; however, when the utility of the product is also to enhance or expand the story with meaningful content or experiences, it can also be engaging. Given the expansive nature of transmedia storytelling the need to spend more money is a necessary evil in order to engage in a multiplicit story experience in a commercial environment. Like the first two points, this reality is not mutually exclusive with quality content. The above points taken into consideration, I am excited about Disney Infinity. Excited because it might allow me to engage with the Disney universe in new and compelling ways. Excited because it might allow me to play with the worlds I love and long to inhabit. And excited because collectability facilitates immersion; especially when grounded on the basis of a compelling storyworld and especially to adult fan-girls who love to collect. It might be amazing. That’s a lot of might for one small mouse. Let’s hope he delivers.